Concise details on the Walking Tour du Mont Blanc in Comfort & Self-guided trip can be obtained by downloading the tour pdf [right]. Alternatively, read the TMB tour description below and click through the sub-headings in the right-hand column for background information. View a Relive Video of each day’s walking – see the detailed, day-by-day TMB tour itinerary below and enjoy this latest fascinating insight. Reserve your trip before December to avoid disappointment. While booking accommodation for our shorter Alpine trips can still be okay into June, reserving the whole TMB trip in Comfort is very difficult after February, unless you have an extremely open diary. alking Tour du Mont Blanc in Comfort & Self-guided is our 11-day [12-night] hiking tour of the complete and legendary Mont Blanc/TMB route.If you want to walk the TMB in one single trip, and under the best possible conditions, then this is the tour for you. Walking Tour du Mont Blanc in Comfort & Self-guided helps you achieve this life-time ambition by dissecting the TMB route into walkable segments that most active and healthy individuals can hike. Our guiding objectives are daily and manageable challenges complemented by excellent accommodation. You have time to enjoy the scenery and recuperate with ease for the next day in the comfort of your private room. Experience the finest sights available whilst hiking four-and-a-half days in France and Italy plus two days in Switzerland. Based on departure from Courmayeur, we get you up to speed via an average of five hours of moderately-challenging walking per day during the first half of the trip. The second half is slightly more challenging, with up to six-and-a-half hours of walking per day. Best comfort available, you walk at a relaxed pace. Stay in comfortable hotels & auberges throughout – i.e., no refuges [11-night trip]; with one refuge used in the 12-nighter [private room, no dormitories]. Two starting points to suit your preference. Walk options/variants to suit your preferences on two days. We transfer your luggage from inn to inn. Self-guided, 12-night, challenging trip, in comfort and at a more relaxed pace. Luggage transfers from start to finish. Start any day from 23rd June to mid-September. Average 5½ hours and 9½ miles-15½ kms a day. Tour starts and finishes in sumptuous Courmayeur, Italy [just 30 mins from Chamonix, France via the Mont Blanc tunnel] or in Chamonix, France. Best access: 30 mins bus from Chamonix, France and daily services from main cities in northern Italy and Geneva airport (Switzerland). Carefully-selected hotels & auberges of a high standard, with private rooms [no ‘dortoirs’/dormitories] throughout and en suite facilities the norm. 9 evening meals* – leaving you free to choose where to purchase dinner in Chamonix & Courmayeur, where options abound. 1:25,000 scale maps & comprehensive, themed vacation dossier. Emergency telephone help-line service open 7/7 and 8 ’till late, with native-English speaking backup. ¹ 20 kgs Max. weight applies – please ask us for details. By Road – Courmayeur is easily reached through the Mont Blanc tunnel from Chamonix in France, from where a regular bus service takes around 30 minutes. 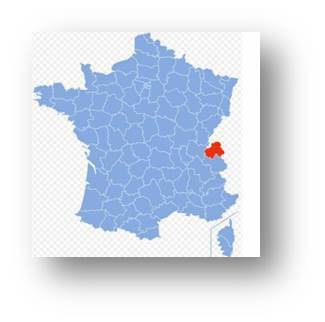 Please click here for details; Road access is also possible from Geneva airport. 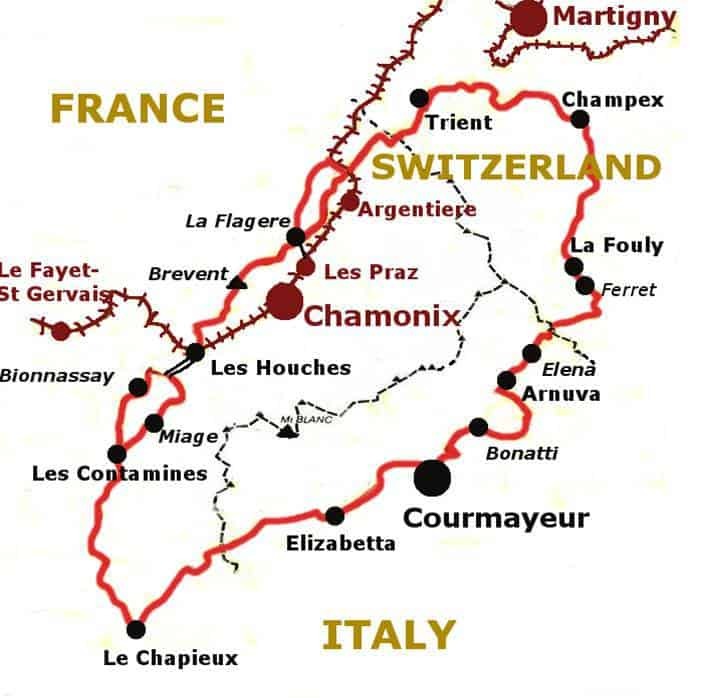 The company SAT run a bus service to Chamonix, which connects with their above-mentioned Chamonix-to-Courmayeur line. Alternatively, most people prefer a shared shuttle from either Geneva airport (90 minutes) or the main cities of northern Italy Turin (an hour’s drive), Milan or Genoa. By Train – Courmayeur does not have a train connection. However, travelling by train from Italy is recommended as far as Aosta, from where a bus connection will take you to Courmayeur. By Air – The nearest airports are Geneva, Turin’s Caselle and Milan’s Malpensa and Linate. Note: option to merge Days 11 and 12 [approx.6½ hrs] via a shuttle bus to Courmayeur, thus avoiding the over-nighter in Elizabetta. Ask us for details. If you particularly wish to experience a middle-mountain refuge, we know the best ones and are happy to build in such an overnight experience [comprising as many ‘mod-cons’ as possible, incl. private bedroom] that keeps you high up on the trail, and obviates the habitual late-afternoon descent and next-morning climb. Please ask us for details. Whilst you can start in Italy or France, we recommend you commence the tour in Courmayeur, Italy. The two final days are then ‘relatively leisurely’ at five hours each. This allows you ample time to get the walking done early and enjoy the overnight destinations to the full. You can, however, merge these two days into a longer final day and avoid the over-nighter in the refuge Elisabetta. However, you miss some of the final highlights and take a shuttle bus to Courmayeur instead – not available in September! Some of the Tour du Mont Blanc variants are verging on the ‘Are you nuts?’ end of the challenge stakes. Fear not! We bring you two days when you can choose which route to take. The first option gives vertigo sufferers the chance to avoid the ladders section of the main TMB route. The second option allows you to treat the Les Houches to Les Contamines stage as either a ‘rest day’ or another challenge. Both ‘tougher’ options should be avoided in inclement weather. We offer you two starting points for La Tour to suit your preferences. Courmayeur, Italy, is in pole position, just the other side of the Mont Blanc tunnel from Chamonix. The tunnel is only 14 kms long, with easy access from Chamonix by a regular bus service that takes 30 minutes. Courmayeur is also easily reached from Geneva by either bus or airport shuttle. Chamonix in France is our alternative starting point. Either way, you avoid the main rush of hikers who follow the pack and commence Le Tour in Les Houches. Walking Tour du Mont Blanc in Comfort & Self-guided includes luggage transfers, most evening meals and requires no guide. You will meet many willing companions en route, but our industry-leading walking notes empower you to hike this extraordinary trail in the company of your own choosing. Snow normally clears from the higher passes from mid-June and returns at any time after late-September. We are happy to take reservations from the last week in June. Book early, get the best accommodation reserved and look forward to one of life’s rights of passage. Climb up past Refuge Elena and enjoy the fine descent into Switzerland from the Grand Col de Ferret. The morning river-hugging trail is a delight to behold, while the afternoon climb to the banks of “Little Canada” is a real gem. The views down the Upper Rhone Valley from Bovine are a treat and the descent to the Franco-Swiss border is absorbing. The video takers visited an off-piste belvedere before commencing the day’s walk. Night in Trient or Forclaz. The climb to the Col de Balme is breathtaking and the views as you descend into France are as exceptional as they are expansive. The video takers stayed in a 4-star hotel on the southern outskirts of Argentière. To view a Relive Video of the day’s walking, click here. Two options for the climb up to Lac Blanc: the GRP and the ‘Grand Balcon du Sud’ or the gentler climb via the TMB proper with the ladders. Imagine you’re the only one there! Then descend the rocky steps to La Flegere and take the cable-car to Les Praz. The video takers opted for the main GR Ladders’ route. Walk out the hotel, take the cable car up to La Flagere and get straight into the TMB action: le Balcon du Sud, the splendid col du Brevent and the magnificent panorama from Brevent itself. The video takers opted to walk up to Le Flagère from Les Praz and continue only as far as Brevent; from where they took the cable cars down to Chamonix and the Mont Blanc train to Les Houches – thus avoiding the long descent (see walking notes). Avoid the knee-crunching and monotonous climb and take the cable car up to Bellevue. Depending on the weather, and your mood, opt for the trail that suits you best to Les Contamines. The video takers opted for the High Route. Follow the Bon Nant Torr past Notre Dames de la Gorge. Pass two refuges en route to the Col du Bonhomme and Col de la Croix. Lunch in the refuge du Bonhomme is recommended before the descent to Les Chapieux and your welcoming auberge. The Vallee des Glaciers is a joy to behold. Take a quick drink at Les Mottets before climbing up to the Col de la Seigne and into Italy. The views are delightful as too is the descent into Lex Blanche. Your final day takes you further down the Lex Blanche. Then climb up past abandoned farmsteads overlooking the remains of the Miage Glacier. The balcony trail to the Col Checrouit makes for a fine end to this superb hiking trip. Note: option to merge Days 11 and 12 [approx.6½ hrs] via a shuttle bus to Courmayeur, thus avoiding the over-nighter in Elisabetta. This option is not available in September. Please ask us for details. Day 13: Departure day and end of your Walking Tour du Mont Blanc trip – breakfast and onward journey by bus to Chamonix, Milan or Turin or transfer to Geneva – Bon Voyage et à bientôt! Options on two days to suit you: the High or the Low Route and avoid the 'ladders section'. Most days involve morning ascents and afternoon descents - well worth the effort, but we help you avoid the worst via two cable cars. A once in a lifetime experience that will fulfil most hikers' dreams of crossing international frontiers on foot. A right of passage par excellence!"